Bravada Gold Corporation Listing (TSX.V: BVA) (SSE:BRTN) (OTCQB: BGAVF) is a Nevada-focused exploration and development company, exploring for precious metals in well-established gold trends in one of the world’s best gold jurisdictions. The Company has a large portfolio of high-quality properties covering a range of development stages from early-stage exploration to advanced-stage exploration and pre-development. The company was formed by the amalgamation of Fortune River Resource Corp and Bravada Gold Corporation, itself a spin-off of Bravo Gold Corp’s Nevada property holdings. Bravada controls 11 Nevada properties, approximately 9,200 hectares, located in the Battle Mountain-Eureka, Walker Lane and Austin gold trends. The company also owns the Drayton project, an Archean gold property located in Ontario, which it has optioned for possible sale to Duncastle Gold Corp.
Bravada’s Wind Mountain property, a potential near-term producer with a 43-101-compliant resource and 2012 positive PEA, is at the pre-development stage. The Quito and Baxter properties are Bravada’s most advanced exploration-stage properties, with Quito being advanced by Coeur Mining Inc. The Company works with partners to explore properties and seeks additional qualified partners to advance select properties, many with drill-ready targets. 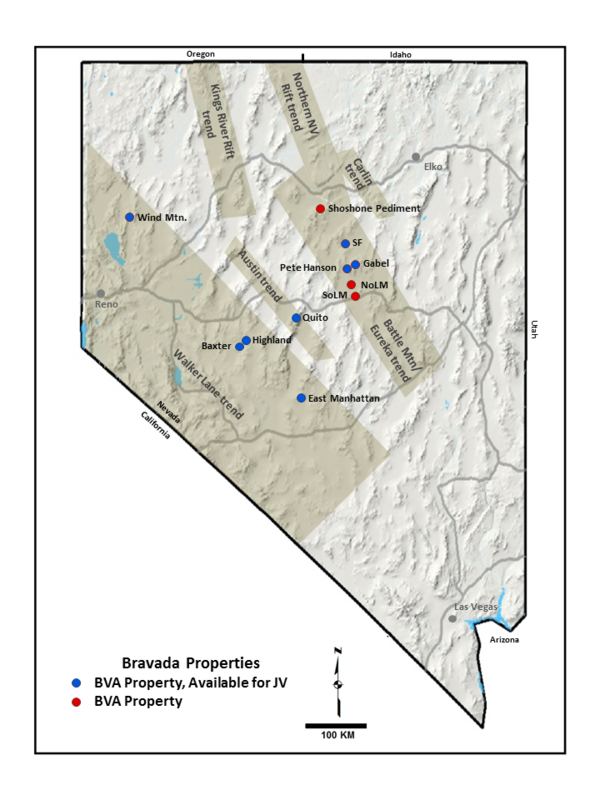 Bravada Gold Corporation., through its wholly owned US subsidiaries Bravo Alaska, Inc. and Rio Fortuna Exploration (U.S.), Inc., controls 11 exploration properties, (approximately 9,200 hectares or 35.5 square miles), in several of Nevada’s productive gold trends; several of the properties are drill-ready. 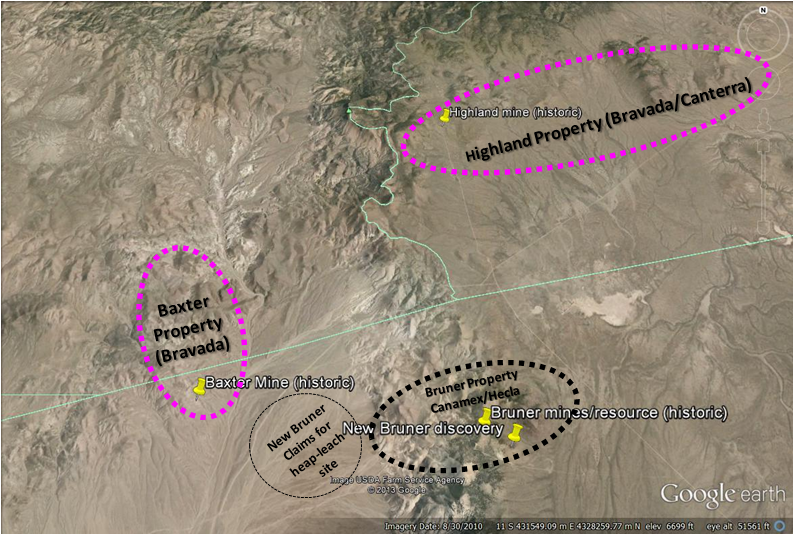 Bravada owns 70 claims that comprise the Shoshone Pediment property. Low-level gold and encouraging pathfinder geochemistry are widespread in generally unfavorable Upper Plate rocks. The property is near the northwestern projection of a series of small gold deposits in Upper Plate rocks at US Gold’s Slaven Canyon property. These gold deposits are between approximately 1.5 and 8km southeast of the property. More prospective Lower Plate carbonates are at an unknown depth. In May 2013, Baker Hughes, has notified Bravada that it has completed a third phase of drilling at Bravada’s Shoshone Pediment gold and barite project. The program, designed to test for the presence of barite mineralization, consisted of an additional 12 reverse-circulation drill holes (719m). The total program during 2013 consisted of 43 holes, for total of 3,030 meters of drilling. 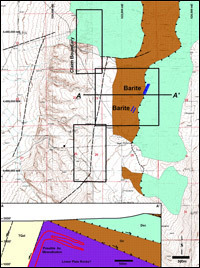 The property is located along the Battle Mountain-Eureka Gold trend, which, in the project area, overlaps one of Nevada’s most important regions for barite production. Baker Hughes has the option to acquire 100% of any barite ore, whereas Bravada will retain all other mineral rights, including gold, and will receive a split of the drill samples from the barite drilling for its independent geologic logging and assaying. Gold and other mineral values will be reported subsequent to evaluation by Bravada of assay data. Baker Hughes exercised an option to purchase rights for barite only. Bravada will receive a quarterly royalty payment on any barite production greater than 150,000 tons. Should there be a discovery of both barite and other metals; each company would have the right to mine their respective minerals while stockpiling minerals belonging to the other party. Bravada owns a 100% interest in 56 unpatented lode-mining claims that comprise this project, subject to a 1% NSR royalty, which can be reduced to 0.5% NSR by payment of US $3 million at any time. 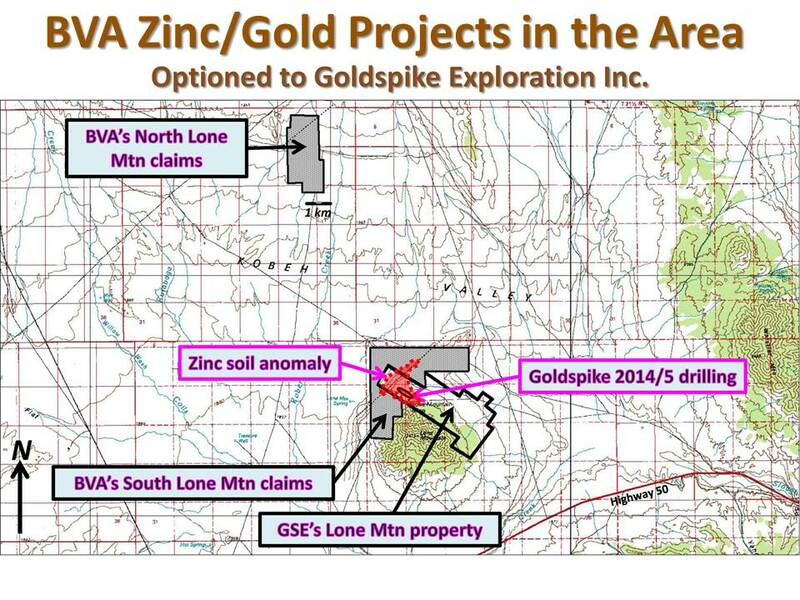 In March 2015, an agreement was signed with Goldspike Exploration Inc. (now Nevada Zinc Corp.) allowing Goldspike to earn 50% interest in the North Lone Mountain Claims by financing a work program of $150,000 (U.S.), after which the companies will form a joint venture to further explore and develop the property. The project is located in Kobeh Valley just off of the southern edge of the Roberts Mountains. The property is concealed by alluvium, but Paleozoic sediments are exposed immediately west, in low hills, north in the Roberts Mountains and south at Lone Mountain. There are various drill holes located on and adjacent to the claims, for which limited data is available. Beneath alluvial cover is basement composed of carbonate rocks, referred to as Lower Plate, and siliclastic rocks, referred to as Upper Plate rocks. Depth to bedrock is believed to range from 0m to +400m in the project area. Lower Plate carbonates that have been recognized in drill holes include the Lone Mountain dolomite and various overlying limestone, silty limestone, and dolomite, including the Bartine member of the McColley Canyon formation and the Denay formation. The Bartine member and Denay formation host the Gold Bar Mine deposits. Another potential ore horizon is the unconformity at the base of the Webb siliciclastic rocks. Nevada Zinc Corp. also controls the Lone Mountain zinc project, located approximately 10 kilometres to the southeast where Goldspike is delineating high-grade zinc mineralization and has an option to purchase a 100-per-cent interest through payments of cash, shares, and a retained royalty in Bravada’s South Lone Mountain property. South Lone Mountain is adjacent to the Lone Mountain zinc property and soil geochemistry indicates that mineralization extends onto Bravada’s claims. In October 2014, Bravada entered into a lease with option to purchase agreement with Goldspike Exploration Inc. (now Nevada Zinc Corp.) to acquire a 100% interest in the property for lease payments of $325,000 over ten years. 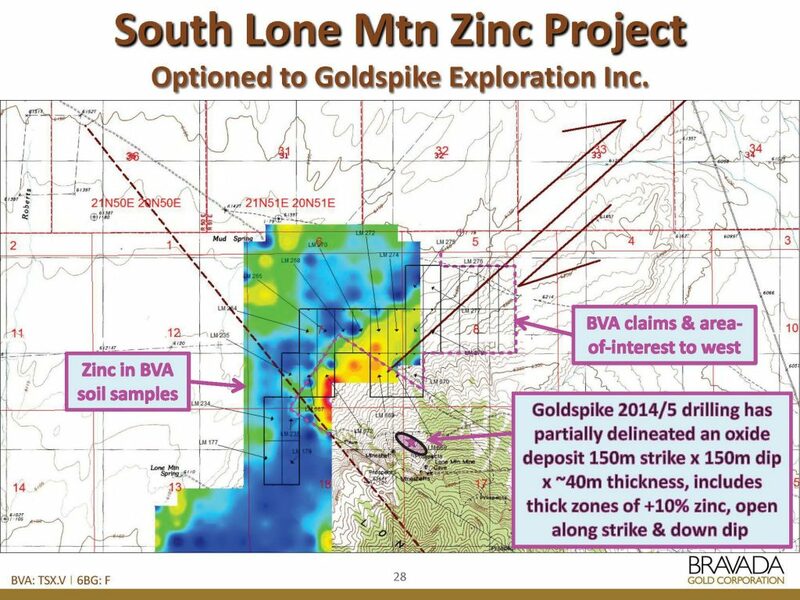 In addition, Bravada will receive 50,000 Goldspike common shares upon receipt of TSX Venture Exchange approval (complete) and another 100,000 Goldspike common shares in the event a National Instrument 43-101 combined resource estimate for the company’s Lone Mountain zinc property and the property indicates that at least 10 per cent of the reported tonnage is attributable to the property. All lease payments can be applied to the final purchase price of $325,000 (U.S.), after which advance minimum royalty payments become due annually in the amount of the cash equivalent of 50 ounces of gold. Bravada and a previous owner of the property have royalties on production from the property. Bravada holds a 1.5-per-cent net smelter returns royalty on base metals production and a 3-per-cent net smelter returns royalty on precious metals production. Bravada’s base metal NSR can be reduced to 1 per cent and its precious metals NSR can be reduced to 1.5 per cent concurrently, not individually, by Goldspike for a total cash payment to Bravada of $3-million (U.S.). As indicated in the first paragraph, the previous owner of the property holds a 1-per-cent NSR on both base and precious metal production from the property. Goldspike can concurrently, not individually, buy down the royalty on both base and precious metals to 0.5 per cent for total cash consideration of $3-million (U.S.). The Quito project is located within the Toiyabe Range in southern Lander County and is about 30km south of Austin, Nevada. The project occurs along a postulated northwest trend (referred to as the Austin trend, or Western Rift) that extends from the Hot Creek Range on the southeast to the Black Rock desert on the northwest. Gold mines and mineralization identified along this trend include Northumberland, Quito, New Pass, Florida Canyon, Rosebud, and numerous other prospects. Access is via paved, improved gravel and two track roads. The project consists of 342 unpatented lode claims (approximately 2,768ha) in sections 1 & 12 of T17N, R43E, section 6 of T17N, R44E, sections 13-15, 22-27 & 34-36 of T18N, R43E and sections 18-20 & 29-31 of T18N, R44E. The Company signed a letter of intent with Meridian Gold (the US operating subsidiary of Yamana Gold) during November 2010. Bravada can earn 70% interest in the property by spending US$2,500,000 over 5 years. 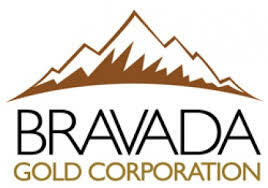 Within 60 days after Bravada earn-in, Yamana can either: 1) elect to participate at 30%, 2) elect to earn 51% should a deposit of greater than 2 million ounces be discovered by paying Bravada three times Bravada’s exploration expenditures and funding Bravada’s share of capital requirements (repaid out of 80% of Bravada’s cash flow), or 3) Elect to reduce to 2% NSR and receive $500,000 cash or BVA shares (at Bravada’s option). No other royalties exist at the property. Bravada can elect to terminate the agreement after a firm commitment of $500,000 within one year of signing a formal Earn-in Agreement has been spend and certain claim fees have been paid. In July 2015, Bravada signed a Letter of Intent with Coeur Mining, Inc. (NYSE:CDE) for an option to earn into Bravada’s interest in the Quito Property. Coeur may earn into Bravada’s interest in the Quito property, which can range from 49% to 100% as described in the Bravada news release dated July 28th, 2015, over a period of five years by funding Bravada’s earn-in work commitments of US$2.5 million, making an initial cash payment of $10,000, cash payments of US$50,000 by 15 January 2016 and $50,000 on the first anniversary of the execution of a definitive Earn-In Option Agreement, reimbursing Bravada’s US$93,600 cash bond for Quito by the end of 2017, and paying Bravada an option purchase price of US$2 million and a 2%NSR royalty on Coeur’s percentage of any production. Coeur returned the property to Bravada in January 2018. FMC Corp., FMC Gold, Inspiration Gold, Inc. and various other exploration companies have completed several sampling programs, geophysical surveys, and drilling campaigns on or near the property. Gold was produced from both open-pit and underground mines by the Austin Gold Venture (AGV) and was processed using sulfide flotation followed by carbon-in-leach. Available data sets include most of the historic drilling; however, none of the drill data has been independently verified at this time and is used only in guiding exploration. Compilation of available data and 3D geologic modeling are in progress; whereas surface work and possible geophysical surveys are in the planning stage by the Company. Meridian Gold filed a Plan of Operations with USFS and successfully permitted the plan for exploration drilling. Yamana Gold acquired Meridian in late 2007 and decided to suspend funding for the Nevada-based programs that Meridian had in place. As part of the agreement with Meridian Gold, Bravada will take over recently approved Plan of Operation, replacing Meridian Gold’s $96,300 reclamation bond. Accessibility and logistical issues are favorable for the development of a mine should an economic discovery be made. From the north, access is by a good gravel road (known as the Gold Venture Road). NV State Hwy 722 exits US Highway 50 approximately 3km west of the town of Austin and proceeds southwestward 3km to the Gold Venture Road. This road was upgraded and built to access the gold mine in the 1980’s and provides good access to the open-pit mines. Approximately seven miles of this road was utilized as a haul road when the mine was active. The Gold Venture road has many curves in some of the more rugged terrain through which it climbs and is impassible during winter. The road distance from Austin is about 35km. A secondary access route to the project is through Birch Creek from Smoky Valley east of Austin. This route is longer and the road up Birch Creek is more primitive so the preferred access is from the west. Several roads access many of the prospects on the property and provide good access to within about 1km of most portions of the property. Topography is moderate to very steep. Elevation ranges from about 1,950m to 2,750m at Quito. The area is mostly non-forested and covered by sage-dominated vegetation with minor grass. Local groves of aspen and mountain mohagany are common. Lower slopes and north-facing slopes are covered by stands of pine trees. Moderate to heavy amounts of snow may cover the area in the winter. Melting snow in the spring often creates muddy road conditions. Motels and restaurants of various qualities are available within a 0.5-hour drive of the Quito property in Austin. Should an economic discovery be made, improvements to necessary infrastructure, such as power, water, access, housing, etc., should be reasonably inexpensive due to the proximity of the property to available logistical support utilized by the previous gold mine operation. A commercial airport is available at Reno about 295km west of the property. Supplies can be trucked to the site from Reno, Nevada, Salt Lake City, Utah or Boise, Idaho. Interstate 80 and a rail line are located at Battle Mountain 160km north of the property. FMC completed a district-scale evaluation during 1983 that culminated in drilling an additional 54 holes to test near-surface geologic, geochemical, and geophysical targets. These results were insufficient to maintain funding and the company decided to farm out the project. FMC signed a JV agreement in August 1984 with Inspiration Gold, Inc. (which later became WestGold following a merger with Minorco in 1988). Inspiration was the operator for the Austin Gold Venture. The AGV built a 1,000tpd gold processing facility, offices, and assay lab in Reese River Valley. Between 1986 and 1988 174,460 ounces gold were produced at a recovered average grade of 5.92g/t gold. All facilities were removed and the mill site reclaimed. The Quito property was farmed out to White Knight Resources in 1996. WKR re-mapped the Birch Creek Window and collected additional surface rock-chip samples. Significant horizons of calcareous siltstone that FMC and AGV had previously placed into the Upper Plate Valmy Formation were reinterpreted as Roberts Mountain Formation. WKR drilled seven RC holes totaling 1,400m in 1998, all in the Russ’ anomaly area, results were negative. The deepest hole went to 266m, but failed to reach Lower Plate carbonate rock. Prior to acquisition of the property, the Bravada’s consultants completed a review of data sets provided by Yamana. The data includes soil and rock geochemistry, geophysical surveys, and available historic drill data. Geologic logs and geochemistry are available for many, if not all, drill holes. None of the historic data has been independently verified; however, this data will be used to guide new exploration efforts and might be acceptable for resource calculations if verified in the future. No new sampling has been completed by the Bravada to date. A review of the historic data suggests that surface-sample spacing was determined by the distribution of rock exposures and float of altered rock, and not by a grid with pre-determined sample spacing. 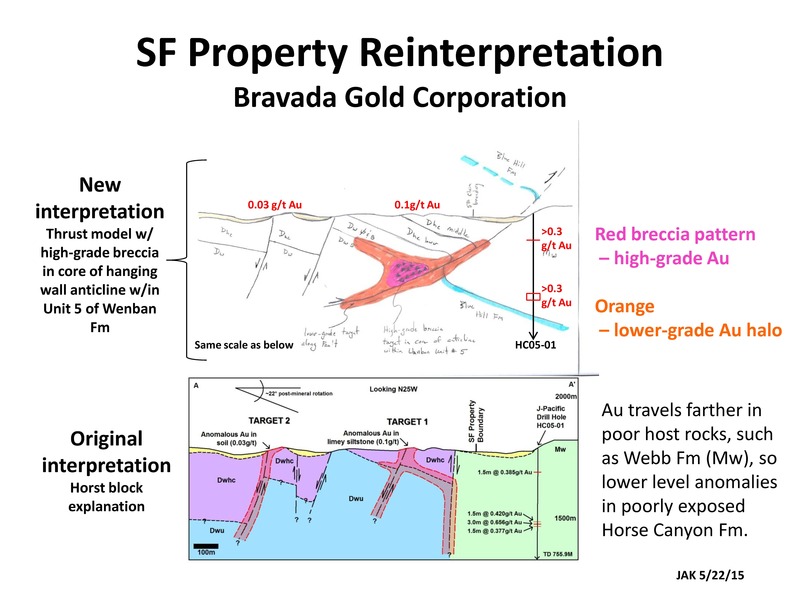 The purpose of the surface-sampling program was to identify and confirm the presence and strength of gold anomalies on the property in order to identify prospective drill targets and to determine if metal zoning is present. The samples, generally 1 to 4kg, are believed to be representative of mineralized material. Some samples were collected over measured distances along road cuts and in the previous mine operation. Extensive soil grid sampling was also completed by FMC in the early 1980’s. The Quito Project is a sediment-hosted gold property. The prospect has potential to host significant sediment-hosted gold mineralization typical of other large gold deposits of this type in Nevada. Gold was produced from a small open-pit mine in the 1980’s. Shallow deposits within the Upper Plate rocks are possible, but the most significant potential is believed to be within the Lower Plate rocks that underlie portions of the property at reasonable depths. The area controlled by the claim position is large enough to host all, or a significant portion, of a major gold deposit of several million ounces. Access is good and topography is favorable for relatively inexpensive drill testing. Should an economic discovery be made, improvements to necessary infrastructure (power, water, access, housing, etc.) should be reasonably inexpensive. The former operation is still under mitigation between the USFS and Yamana for closure and reclamation. There are no known new environmental, social or logistical impediments to developing a new underground mine at Quito. Located ~9km southwest of the Highland property, the land package consists of 243 unpatented lode claims totaling ~1,940 ha and is accessible year-round by good gravel roads. Initial sampling by Bravada returned 16 of 51 samples with values from 1.0g/t to 21.2g/t Au, including seven samples >10g/t Au with up to 132g/t Ag. The silver to gold ratio is less than 10:1, indicative of a gold-biased system. The company’s shallow drilling program in 2004 intersected narrow intervals of high-grade gold, including 1.5 metes of 9.12 g/t Au within 6.1 meters of 3.50 g/t Au beginning at 51.8 meters depth and 1.5 meters of 7.38 g/t Au within 10.7 meters of 2.00 g/t Au beginning at 47.2 meters. 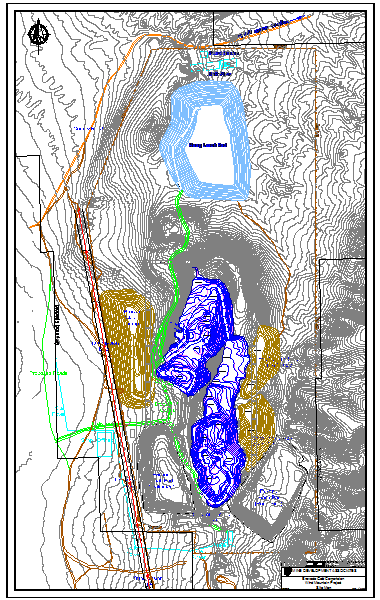 The Highland low-sulfidation-type project consists of 102 Federal lode claims for a total of approximately 1,070 hectares.The property is located in the Walker Lane Gold trend, north of the historic Bruner gold mine. Previous drilling by Bravada’s US subsidiary intersected vein zones with locally high-grade intercepts; the Company’s best hole, H02013, intersected 1.5 meters (m) of 66.9 grams of gold per ton (g/t) and 397.7g/t silver within a 12.2m intercept of 9.5g/t gold and 109.4g/t silver, with true thicknesses estimated at 65% of the intervals. A thin layer of alluvial gravel covers much of the property and various geophysical methods have been employed to identify other targets, which to date have not been tested with drilling. Detailed ground magnetics, four lines of IP, and one line of AMT have been conducted at Highland. No information is known about the early history of the Highland mine, also known previously as Magmatic Quartz mine. Gold is believed to have been discovered at Highland early in the 1900’s, after gold was discovered to the north at Gold Basin and Eastgate. Highland was developed in the 1930’s by a shallow incline shaft and a 50m-deep vertical shaft according to handwritten records and old reports. The project was reported to have produced for about 10 years from the early 1930’s into the early 1940’s, with production believed to have been not more than 10,000 ounces of gold. Reports indicate that minor production occurred at Highland in 1935 and again in 1955-56. The workings are currently inaccessible. Exploration of the Main Highland target prior to the 1990’s was limited to trenching and drilling 13 shallow holes, which only explored the veins to a maximum depth of about 60m. The best intercept reported from this drilling assayed 3.6g/t Au over 5.8m, including 1.2m of lost core that was given a value of nil for this calculation. Checkmate Resources Ltd. and Miramar Gold Corporation did trenching during this period; some of the trenches remain open. Fairmile extended the land package to cover the Big Hammer target, where low-to-moderate concentrations of gold were detected in surface samples. Cordex Exploration Company drilled 21 holes at this target during 1984 and 1985, and Fairmile obtained copies of their data. Cordex’s drilling indicates little potential for an economic disseminated gold deposit within 150m of the surface; however, untested potential for high-grade gold and silver feeder veins at depth deserves further evaluation. Hecla entered into an earn-in agreement with Fairmile from 1999 to 2000, and conducted a program of detailed ground magnetic geophysics over the Main Highland target and trenching at the Deb and Main Highland targets. 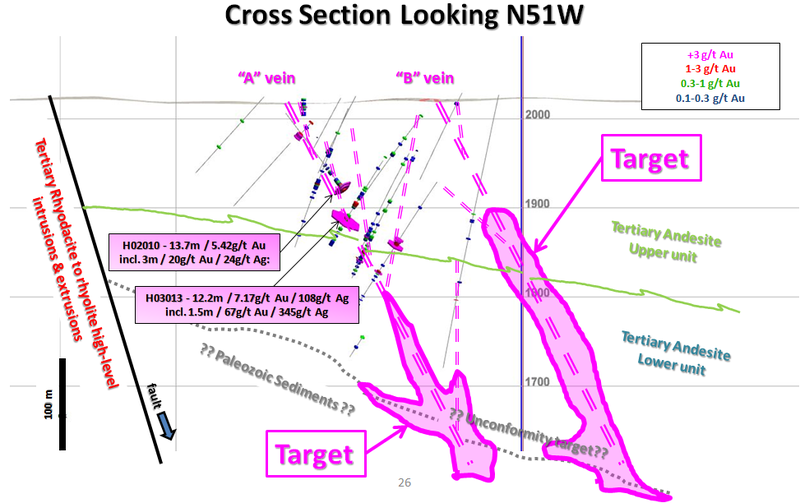 The Deb target was trenched to determine the source of anomalous gold in float samples, which was determined to be mineralized boulders weathering out of a debris flow of Tertiary age. Based on rare and inconclusive paleodirection indicators, the source of the debris flow, and its mineralized boulders, lies to the west of the trenches, under alluvial cover. Another Hecla trench indicates that, based on weakly anomalous concentrations of gold and high concentrations of pathfinder metals in chalcedony/quartz veins, the Highland vein system extends to the southeast, adjacent to the Highland dome. A drilling program was permitted in order to test two structurally open portions of the Highland vein system; however, Hecla’s management cut their U.S. exploration budget prior to drilling and returned the property to Fairmile. Fairmile defaulted on the property in 2001 due to lack of payments to the underlying owners. When the Company’s program started in 2002, only 13 drill holes (five core holes, with one lost prior to targeted depth and then offset, and eight reverse-circulation rotary holes) existed at the Main Highland Target. Checkmate Resources LTD of Vancouver, British Columbia drilled 11 of these holes and Frank Lewis, a previous property owner, drilled two of them (one 65′ deep and the other 205′ deep). Checkmate drilled 306m of core (HQ size, with +95% recovery except in faulted zones) and 610m of rotary drilling. Hunter Mining Laboratory of Sparks, Nevada did fire assaying for Checkmate’s drilling. Although strongly anomalous concentrations of gold were encountered, none of the holes intersected the vein deeper than 53m below the surface. The past-producing Wind Mountain gold/silver project is located approximately 160km northeast of Reno, Nevada in a sparsely populated region with excellent logistics, including county-maintained road access and a power line to the property. A previous owner, AMAX Gold recovered nearly 300,000 ounces of gold and over 1,700,000 ounces of silver between 1989 and 1999 from two small open pits and a heap-leach operation (based on files obtained from Kinross Gold, successor in interest to AMAX Gold). Rio Fortuna Exploration (U.S.) Inc., a wholly owned US subsidiary of Bravada Gold Corporation, acquired 100% of the property through an earn-in agreement with Agnico-Eagle (USA) Limited, a subsidiary of Agnico-Eagle Mines Limited, which retains a 2% NSR royalty interest, of which 1% may be purchased. (3) Pre-tax costs include estimated Nevada Net Proceeds taxes, but not corporate income tax. After tax includes corporate taxes, silver is treated as a by-product credit. Sensitivity studies by MDA indicate that gold and silver prices 30% higher in the same modeled pit and at the same recovery rates ($1,690/oz Au and $31.75/oz Ag) would increase the IRR to 74% and the NPV@5% to $136.2 million. Gold and silver prices that are 20% lower ($1,040/oz Au and $19.54/oz Ag) would result in the model being uneconomic at an NPV@5%. Sensitivities of the model to capital and operating costs are also provided. MDA notes that additional studies such as additional metallurgical studies to evaluate crushing higher-grade portions of the deposit and grid drilling to delineate economic portions of the previously mined “waste rock”, which are given no value in the current model, could further enhance the economics of known mineralization. Approximately 43% of the pre-mining strip in the PEA model consists of “waste rock”, and MDA is optimistic that with further drilling and sampling a portion of this material’s grade and tons could be quantified for economic evaluation. Mr. Kizis is a Registered Geologist with a B.S. in Geology from Kent State University and an M.S. in Geology from the University of Colorado. He has 35 years of experience in exploration for gold, silver, copper, molybdenum, lead, zinc, and uranium in the U.S., Canada and abroad. He is the President and a director of Homestake Resource Corp., Bravada Gold Corporation and previously of Fortune River Resource Corp. (which amalgamated with Bravada Gold Corporation in 2011). Mr. Kizis has held previous executive positions with Fairmile GoldTech, Sierra Geothermal, the Geological Society of Nevada, and the GSN Foundation. Mr. McDonald received his Bachelor of Commerce degree from the University of British Columbia in 1964 and subsequently received his designation as a Chartered Accountant from the Institute of Chartered Accountants of British Columbia in October 1968. From 1968 until 1973, Mr. McDonald practiced with Price Waterhouse in Canada and in Australia. From 1974 until 1984, Mr. McDonald worked in private partnerships except for a two year period from 1980 to 1982 when he was a senior officer in a junior resource company. For the past 15 years, Mr. McDonald has been in public practice with his own firm and then joined Smythe Ratcliffe Chartered Accountants in 2005, and has since retired. Working principally with clients related to mining and mineral exploration, he is also involved as director of several junior resource companies. Mr. Kerr holds bachelor degrees in applied science and geological engineering from the University of British Columbia. Over the course of a 30+ year career he has been continuously engaged in mineral exploration and has extensive field experience throughout North America. Mr. Kerr has been a geological consulting engineer since 1970 and has held senior positions with a number of public companies, both as an officer and director. He has been involved with the discovery of a number of significant mineral deposits, including two producing mines and two additional projects currently awaiting production decisions. Mr. Rowley obtained a Bachelor of Science degree from the University of British Columbia in 1990 and has eighteen years executive experience in the mining and mineral testing industries. He was the President and director of Duncastle Gold Corp.’s predecessor company Dundee Mines Ltd. and led its organization and acquisition of mineral properties up to its qualifying transaction in 2007. As VP Operations and later President of Duncastle Gold Corp., the resulting TSX Venture listed mineral exploration company, his responsibilities include property acquisitions, exploration management, and community engagement including First Nations relations. Prior to his role with Duncastle he was President and director of Blue Sky Mines Ltd. where he led the development of a recycling technology based on mining industry techniques through to full-scale operation. Currently he is also a director of Bravada Gold Corporation, and an officer of Sierra Mountain Minerals Inc. He is the co-author of numerous technical papers and obtained two patents on mine water treatment. Other roles in mining technology development and corporate management include long-term roles as President of NTBC Research Corp. and Vice-President of Biomet Mining Corp.
After attending Gordonstoun School and the College of Law in London, Nigel joined Lloyds of London Insurance broker CT Bowring & Co in 1979, which subsequently became Marsh & McLennan. In 1997 Nigel joined Suffolk Life, an embryonic Insurance company. Nigel became a Director in 1998, and over the next 10 years played a pivotal role turning the company into the one of the UK’s leading self-invested personal pension (SIPP) administrators. Nigel was for many years not only the main Media contact at Suffolk Life, but also had sole responsibility for the Sales & Marketing of the business. By 2008 Suffolk Life had £2.5 billion assets under management and the business was bought by Legal & General for £62.5m. Since then Nigel has focused on his various Charitable & Investment interests, which are mainly in the commodity and precious metals space which has become a passion for Nigel.